ENDANGERED SPECIES -- You were more likely to see Santa's reindeer last night than Idaho's wild version of the critter. Woodland caribou were once fairly common in North Idaho. Trapping records from the 1880s indicate that caribou thrived in northern Idaho and could be found as far south as the Clearwater River, according to the latest feature in the Idaho Fish and Game Department's 75th anniversary series of reports. While cold and snow did not affect Idaho’s caribou, an expanding human population began to take its toll. By the 1950s, Idaho’s caribou population had dropped to about 100 animals found only in the Selkirk Mountains of the Idaho Panhandle. In 1980, only 25 to 30 caribou were thought to remain in the state. Unregulated hunting and logging in the late 1800s and early 1900s, in conjunction with some large wildfires, are considered to be the major reasons for the caribou decline. In 1984, the woodland caribou was placed on the endangered species list. Plans for a recovery project in Idaho began. 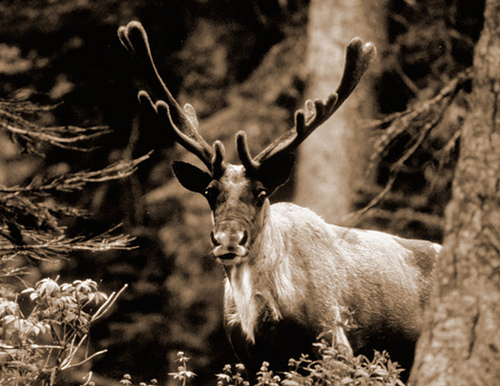 Between 1987 and 1990, 60 caribou from British Columbia were released into the Selkirk Mountains with a goal of establishing a second caribou herd. Habitat changes over the past 100 years have continued to limit the success of the caribou reintroduction. A 2012 survey turned up only 27 animals in the Selkirks. The reintroduction of a native species takes a great deal of planning and care. In some cases it can be very successful. Bighorn sheep were successfully reintroduced to the Owyhee River canyon lands in 1963. Elk were brought into central Idaho following the extensive wildfires of 1910. And following the federal reintroductions in 1995 and ‘96, wolves have become abundant and widespread and are now off the endangered species list. Many factors affect the success of a reintroduction. These include habitat changes, predators, food availability, competition with other wildlife, diseases and parasites and even the weather. In the case of woodland caribou, it appears that habitat changes to their native range in Idaho have had a considerable impact. Timber harvest and large wildfires, changed caribou habitat. The younger forest stages that followed logging and fires could not adequately support caribou. These forests attracted white-tailed deer and with them, their main predator, the mountain lion. Predation by mountain lions combined with habitat change and the caribou’s low reproductive rate, have worked against the success of the caribou reintroduction. What the future will hold for Idaho’s caribou is uncertain. As habitat ages, it will become more favorable to caribou, but this is a slow process. No further reintroductions are planned at the present time. The potential for wild caribou to move into Idaho from British Columbia is limited given the challenges these animals are facing in their Canadian range. Woodland caribou remain one of Idaho’s rarest gems, seen only by those lucky enough to be in the right place at the right time.